Quick overview Teaches over 400 of the most used and useful Chinese characters, phrases and sentences. Organized into eleven themes that reflect our daily lives, this book brings the stories and myths behind the characters to life, providing a unique perspective into Chinese history and culture. ShaoLan Hsueh, a Taiwanese entrepreneur based in London, couldn't find an effective way of teaching her children Chinese, so she developed a groundbreaking visual method to make reading characters fun and easy. By learning the most commonly occurring characters - the building blocks of the entire language - readers of all ages can swiftly grasp basic concepts and words. 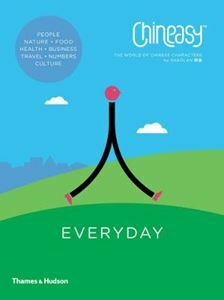 Chineasy Everyday teaches over 400 of the most used and useful Chinese characters, phrases and sentences. Organized into eleven themes that reflect our daily lives, it brings the stories and myths behind the characters to life, providing a unique perspective into Chinese history and culture. "Learning Mandarin just got Chineasy...May revolutionize the teaching of Chinese around the world". (The Sunday Times).